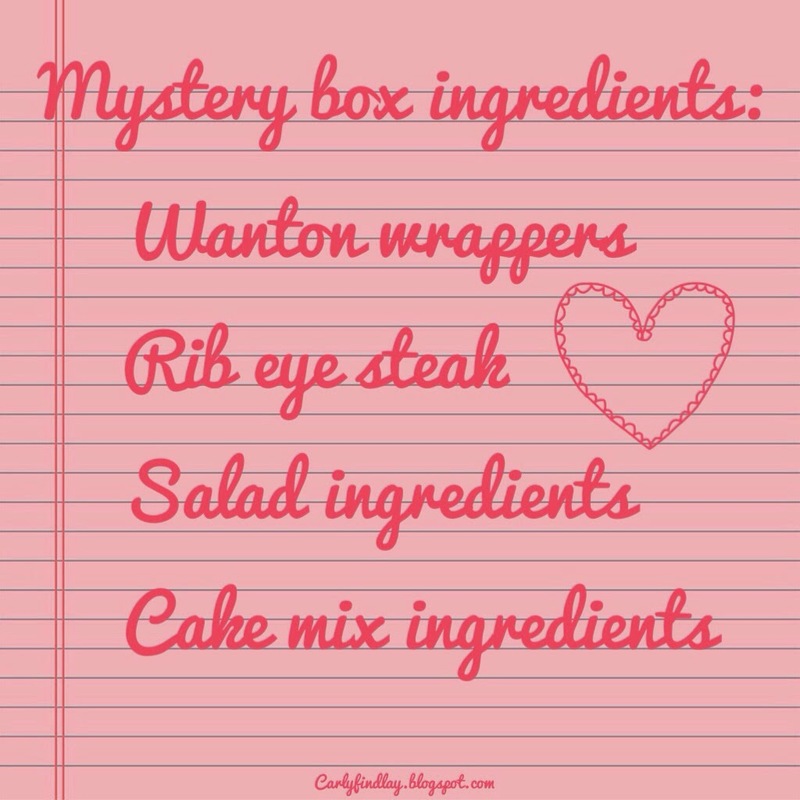 Tune into Radio Carly: MasterChef inspired mystery box challenge for my love. 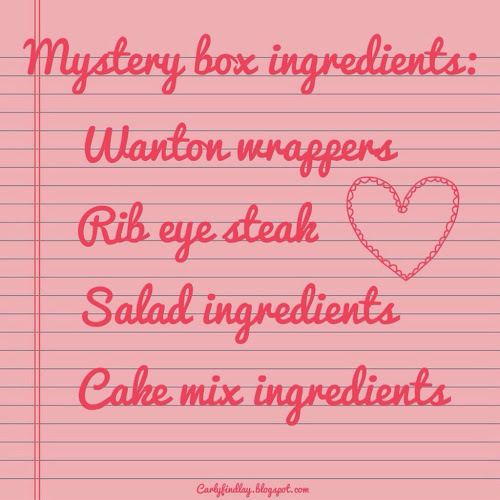 MasterChef inspired mystery box challenge for my love. Firstly, how cute is this?! Oh the romance. Adam and I watch MasterChef together. He started off being openly bored about watching cooking shows - read: yawning - but now he's more eager than me. If I'm not home he will give me an update the next day. He is so tense watching the contestants stress, and tells me what he'd do if he had those ingredients or that pressure. He's also critical of the food or cooking methods - a sign that he's getting better at cooking. He's taken to cooking too. I love seeing him go from unenthusiastic to enjoying pottering in the kitchen, buying ingredients and thinking of new ideas. One night at around 9.00 I said I felt like dessert and he went to the kitchen, shut the door and googled. He came out after two segments of When Love Comes to Town (the only night I watched it), waving his arms in the air, saying "it has to cool, it has to cool"! He made bread and butter pudding in a cup. It was surprisingly good, if a little eggy. Since then he's cooked two bread and butter puddings, some rum balls and brownies. He's also made a lot of delicious omelettes and pastas. And he experiments with hot chocolate flavours. He's so proud. And while I still cook the majority of meals, he helps me prepare. He's good to have around the house! When I was overseas, he said he was so thankful I taught him to cook for himself. We are such a foodie couple. We eat out regularly (though have cut down due to wedding planning). And we talk about and dream about food a lot. He says to me often, "thank god you like eating cheese. I couldn't handle a girl who didn't". At home we like simple, fresh foods. Right now we eat a slow cooker meal a week - a curry or stew or a soup. We love a midweek pasta. And it's fun to make a pizza on the weekends. Last night there was a MasterChef challenge where the contestants were given a mystery box of ingredients and a letter from their loved ones. So heartfelt. Some received ingredients they loved to cook with, others received ingredients that their loved ones wanted cooking for them. Adam asked me what I'd include in his mystery box. I didn't tell him, I said I needed to think about it, and it would also be a fun blog post. And so it is. Here are the ingredients I've chosen for Adam's MasterChef Mystery Box. Because food is love. And of course he'd have access to my well stocked pantry. I'm keeping the ingredients simple because I am playing to his strengths and that's how we eat, but he can cook as complicated as he can manage. Because we love going out for dumplings and I think it'd be such fun to make them at home on a Saturday night. A few drinks, some music and us making dumplings. I'd love to make some tasty vegetarian ones - mushroom and tofu maybe. This would be a great starter. 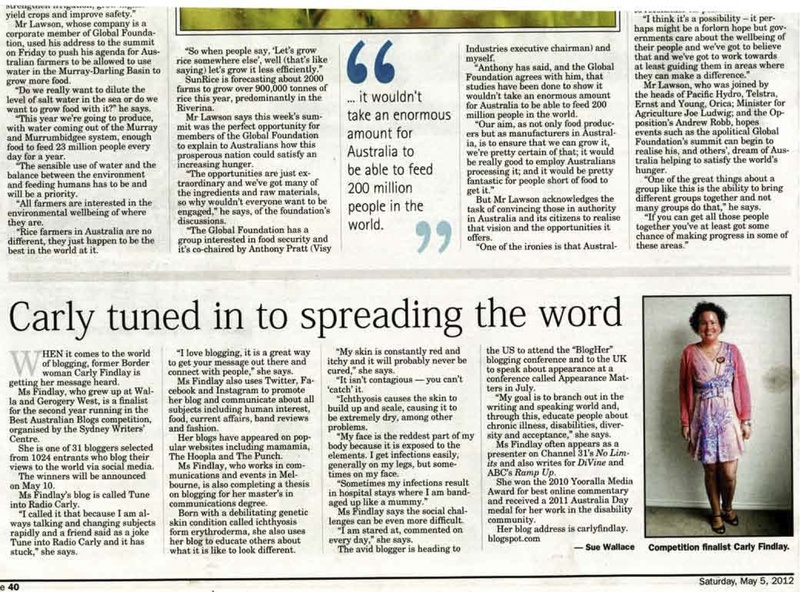 I hope he'd make a sweet and spicy dry rub to recreate that amazing steak we had from the Northcote butchers - we won the meat raffle at Bob Evans' concert in December. Salad ingredients (greens, capsicum, beetroot, tomato etc). He's great at salads. I hope he'd make a warm salad and season it with some interesting toppings like feta, toasted seeds and nuts and some fruit like cranberries or peaches. Basic cake mix ingredients - butter, sugar, milk, flour, vanilla. He loves to experiment with different flavours and I think he'd have fun creating a cake with extra ingredients like chocolate or spices or fruits. I going to give him some of the ingredients and see what he does with them! What MasterChef mystery box challenge would you give your loved ones? Why do you choose these ingredients? How big is food in your relationship? PS: thank you for the love you showed me on my post about the big peel over the weekend. I'm still sore, but I'm slowly getting better. Your lovely words have buoyed me. I cook, my hubby does the dishes. My hubby has couple of dishes but they aren't very mysterious. (Spag bog, stir-fry, mixed grill/bbq). We ate out heaps when we first got together, now we have 5 of us, we tend to do breakfast quite a bit. It is great that Adam has hit his stride in the kitchen. Wow. This is one of the first series of Masterchef that I haven't watched - and now you have me wishing I was! Plus your man is a KEEPER, but it sounds like you already know that :) Looking forward to seeing what he cooks! We had the same conversation but I told j that the ingredients that he chose were too boring and that he had to pick again.